Roadhog and Winston Receive New Updates | Nerd Much? Though the Bastion and Mercy updates are already on the PTR for testing, Blizzard is showing no signs of stopping. This brand new update was announced on the Blizzard Forums, by Principal Designer Geoff Goodman who explained that the development team is working on changes to Roadhog and Winston. And this time it’s not about an exploit or a cheat. Roadhog’s hook is still too strong for Blizzard’s taste, apparently, as new cooldown has increased from 6 seconds to a remarkable 8. However, victims, I mean enemies, can be pulled from 3.5 meters instead of 2 and the Scrap Gun will have 20% less spread. All in hopes that the player will favor the gun instead of the hook. Who knows how that will work out. 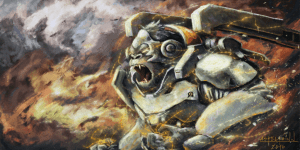 The issues with Winston are finally being addressed, as the studio has noted some of the incoming changes. “Winston’s head hit volume was just abnormally big, making him take more damage than he otherwise should. This change brings it more in line with other heroes.” As such, they have reduced his critical hit volume by 15%, hopefully, that will be a step towards solving that issue. It is not yet known when the PTR testing will be over and the changes implemented in the game for everyone else, but with Year of the Rooster and Overwatch‘s Esports event ending, it might very well be soon. What do you think of these new changes? How will they make a difference for the better or worse? Let us know in the comments below!